For more than half a century, Lyon, France, has been known as a world gastronomic capital, with celebrity chefs like Paul Bocuse, its famed outdoor markets, and fresh produce from the surrounding countryside. 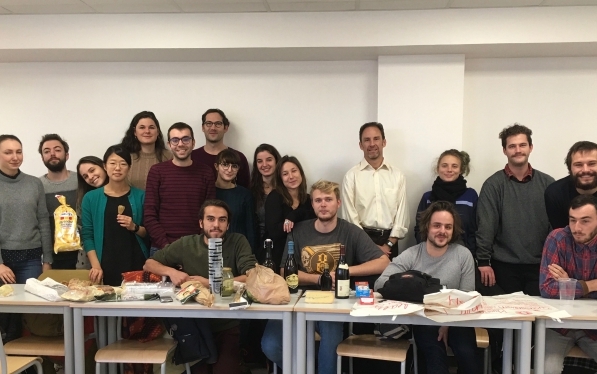 It stood to reason that, naturally, I had to incorporate food into a two-day course I taught on American urban history at the end of November at Jean Monnet University in Saint-Étienne (near Lyon). The program is part of the University of Pittsburgh’s cooperative agreement with Jean Monnet University and Sciences Po Lyon, funded by the Auvergne-Rhône-Alpes region, which encompasses Lyon and Saint-Étienne. Eighteen graduate students, mostly from France, specializing in urban planning, participated. Food? Urban history? What’s the connection? Food, it turns out, is not only a highly desired product among graduate students and instructors alike, but it brings people together, encourages them to take pride in their region’s history, and stimulates conversations that otherwise would have never occurred. The topic feeds into my dissertation, which examines how socially, economically, and spatially marginalized populations in both Pittsburgh and Lyon build social capital as a form of resistance—a way to combat negative effects and connect with mainstream society. But “social capital” can be hard to describe and even harder to illustrate in a group exercise. I define it as a series of interconnected affinities among a community of like-minded individuals. Yet, this somewhat vague definition is made more concrete through food. To illustrate the power of social capital to connect people, the graduate students were asked to bring in their favorite food for the class to share. The results were an impressive array of cheese, bread, soup, preserves, or, in the case of one student from New Zealand, Marmite, a form of Vegemite, best served on toast with butter (he even brought in a toaster for the bread). One graduate student holds up a baguette, another displays nuts from her family farm, and yet another proudly presents cheese from his home region. I brought two of my favorite foods: “Snappers,” pretzels covered in chocolate and caramel from Pittsburgh, and “coussins,” or marzipan “cushions,” a Lyon specialty that honors the town’s defeat of the plague in 1643. The food exercise was the culmination of a seminar that traces the history of urban America since World War II, and included an interactive series of responsive readings and dynamic group exercises. Readings included selections from Le Corbusier’s The City of To-Morrow and Its Planning (1929), and challenges to modernization from books such as Jane Jacobs’s The Death and Life of Great American Cities (1961) and Mindy Thompson Fullilove’s Root Shock (2004). Additional readings covered Saul D. Alinsky’s Rules for Radicals (1971) and two selections on the history of community development corporations in the 1970s and 1980s. The final set of readings emphasized challenges many cities across the industrialized world face, as described in Richard Florida’s The Rise of the Creative Class (2002) and his follow-up, The New Urban Crisis (2017). What surprised me the most about the seminar was the students’ engagement with the material—once they closed their computers, of course. They really dug into questions about what makes a “healthy community,” how to best define “social capital,” and issues of capitalism. In a democratic-socialist country like France, home to Thomas Pinketty, whose Capital in the Twenty-First Century (2013) is a critique of vast concentrations of wealth, “capitalism” can be a bad word. But once the students learned of American-style socially responsible investing, community development financial institutions, and the motivations behind nonprofit community development corporations, which act as developers, as well as neighborhood advocates, they were enlightened. Clearly, though, food was the highlight of the two-day exercise. After all, what better way to make friends with people than to share the quotidian activity of eating. Not only did each student take great personal pride in his or her favorite food, it gave all of us an opportunity to learn about the historic meaning of various foods, talk casually, laugh, and feel good about the program. Food is a powerful form of social capital and is an ideal coda to an in-depth examination of the fate of cities.